Becoming Granola: Doing small things around the house is better than nothing. Doing small things around the house is better than nothing. It's been a month since Keegan's been home from his 2 month deployment. Normally deployments don't derail my whole routine because we are very much used to it. This one was different though. I started training for a half marathon. I was hit with a huge shift in priorities for what I want for my family. The decision was made for me to spend yet another year at home with the kids. I want a simpler, less chaotic life but still have yet to find my groove to make it possible. Now I find myself wanting to do it all. Declutter my whole home and establish some sort of great play/education inspired routine for the kids. No wonder I'm still feeling so scatter brained. Too much to take on at the same time. So I need to start small. I am back to using a great app called Home Routines where I created my own lists of things to do around my home. Sometimes seeing that Accomplishment list get longer and longer is pretty motivating. 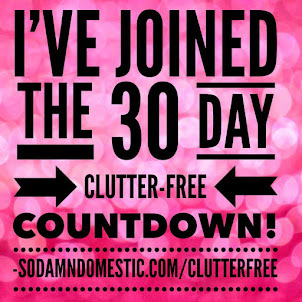 I am also eagerly awaiting an awesome new community put together by Emily Chapelle over at http://www.sodamndomestic.com. Her FREE book Finding the Awesome: 3 Steps to Doing More & Stressing Less was pretty instrumental in my shift in priorities. It truly helped me finalize my choice of wanting to stay home with the kids (more on her awesome book later!). Here I am, enjoying a cup of coffee while the kids play in a tidy living room, and the first load of laundry is almost done all by 9am. It's a start! Like I said, accomplishing small tasks is better than nothing!